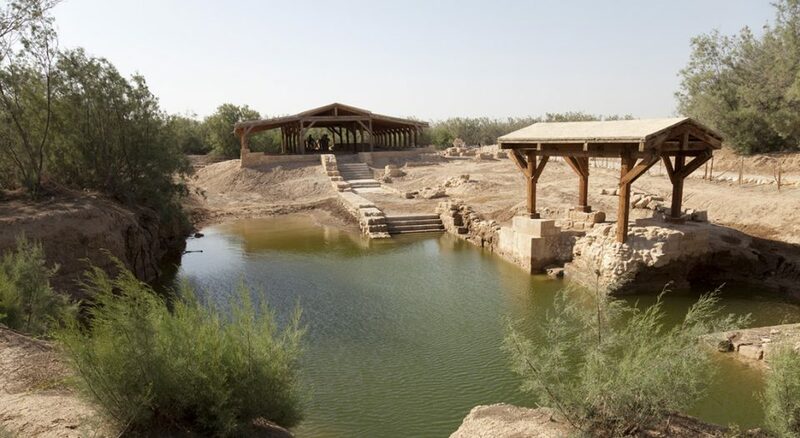 Betania at the Jordan River, considered the site of Jesus' baptism. Hymn: “You Are Mine” (ELW, 581). Song: “Well Pleased” by FFH. In the Gospel of Mark, Jesus’ baptism happens at verse 9 of Chapter 1. The first eight verses of the Gospel are about the proclamation of John the Baptist. There is no birth narrative here. There is no great prologue about “the Word becoming flesh.” The story just starts with adult Jesus being baptized. Even in Matthew and Luke, where we get birth narratives, the start of Jesus’ public life is his baptism. Even in John, with its beautiful prologue, the first time Jesus appears on the scene is when John the Baptist says, “Here is the Lamb of God who takes away the sin of the world” (John 1:29). After that, he tells the people of Jesus’ baptism. In all of the Gospels, Jesus’ baptism was the start of his public ministry. No matter what came before this moment in Jesus’ life, this was the start of people really seeing him. Sure, some may have heard about his birth. And some of the leaders in the temple saw him when he was 12 years old. But it is here, at his baptism, that the world sees who he is. This is his entry into the public eye. This is how he is introduced to the world. Think about how people get introduced today. Think about when a famous speaker gets a great introduction before stepping on stage or about how you introduce your spouse or a friend to someone they haven’t met. Quite often, these introductions talk about all of the wonderful things this person has done. In Jesus’ baptism, that doesn’t happen—because he hasn’t really done anything yet. Also, notice that in the Gospels that do share some of his early life prior to his baptism, Jesus is the one being acted upon (e.g., someone else gave birth to him) than the one who is doing things. At his baptism, in this introduction to the world, Jesus hears those wonderful words: “You are my Son, the Beloved; with you I am well pleased” (Mark 1:11; parallel passage in Luke 3:22). Elsewhere, it’s the crowd who hears this message. “This is my Son, the Beloved, with whom I am well pleased” (Matthew 3:17). This is where Jesus gets his identity. It is not from his accomplishments: it is from God. In our baptism, when we are publicly introduced to the world, we are made new people and given a new identity as God’s beloved children. Despite what we often think, our identity is not based upon our accomplishments or awards or accolades. Our identity comes from God. No matter what our past was like, God calls us beloved children. With water and God’s word, we are given new life. Baptism then sends us forth on an exciting adventure with a new and wonderful identity, even before we have done anything. Read parts 1, 2 and 3 in this series. Kurt Lammi is the pastor at St. Paul Lutheran Church on Dog Leg Road in Dayton, Ohio, and is a frequent contributor to Living Lutheran. His writing has also appeared in Sundays and Seasons, Christ in Our Home and the Journal of Lutheran Ethics. He lives in Vandalia, Ohio, with his wife, daughter, cat and fish.